At a cosmologically crisp one degree Kelvin (minus 458 degrees Fahrenheit), the Boomerang Nebula is the coldest known object in the Universe – colder, in fact, than the faint afterglow of the Big Bang, which is the natural background temperature of space. Astronomers using the Atacama Large Millimeter/submillimeter Array (ALMA) telescope have taken a new look at this intriguing object to learn more about its frigid properties and to determine its true shape, which has an eerily ghost-like appearance. As originally observed with ground-based telescopes, this nebula appeared lopsided, which is how it got its name. Later observations with the Hubble Space Telescope revealed a bow-tie-like structure. The new ALMA data, however, reveal that the Hubble image tells only part of the story, and the twin lobes seen in that image may actually be a trick of the light as seen at visible wavelengths. The Boomerang Nebula, located about 5,000 light-years away in the constellation Centaurus, is a relatively young example of an object known as a planetary nebula. Planetary nebulae, contrary to their name, are actually the end-of-life phases of stars like our Sun that have sloughed off their outer layers. What remains at their centers are white dwarf stars, which emit intense ultraviolet radiation that causes the gas in the nebulae to glow and emit light in brilliant colors. The Boomerang is a pre-planetary nebula, representing the stage in a star’s life immediately preceding the planetary nebula phase, when the central star is not yet hot enough to emit enough ultraviolet radiation to produce the characteristic glow. At this stage, the nebula is seen by starlight reflecting off its dust grains. The outflow of gas from this particular star is expanding rapidly and cooling itself in the process. This is similar in principle to the way refrigerators use expanding gas to produce cold temperatures. 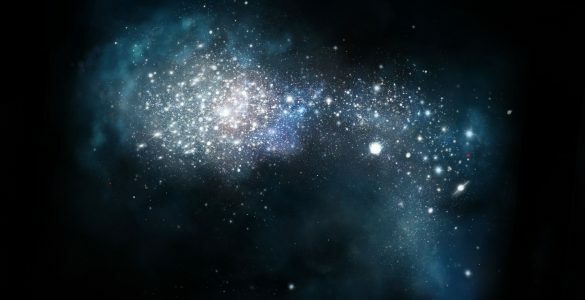 The researchers were able to take the temperature of the gas in the nebula by seeing how it absorbed the cosmic microwave background radiation, which has a very uniform temperature of 2.8 degrees Kelvin (minus 455 degrees Fahrenheit). Observations with single-dish millimeter wavelength telescopes, however, did not detect the narrow waist seen by Hubble. Instead, they found a more uniform and nearly spherical outflow of material. ALMA’s unprecedented resolution allowed the researchers to reconcile this discrepancy. By observing the distribution of carbon monoxide molecules, which glow brightly at millimeter wavelengths, the astronomers were able to detect the double-lobe structure that is seen in the Hubble image, but only in the inner regions of the nebula. Further out, they actually observed a more elongated cloud of cold gas that is roughly round. The researchers also discovered a dense lane of millimeter-sized dust grains surrounding the star, which explains why this outer cloud has an hourglass shape in visible light. The dust grains have created a mask that shades a portion of the central star and allows its light to leak out only in narrow but opposite directions into the cloud, giving it an hourglass appearance. The new research also indicated that the outer fringes of the nebula are beginning to warm, even though they are still slightly colder than the cosmic microwave background. This warming may be due to the photoelectric effect — an effect first proposed by Einstein in which light is absorbed by solid material, which then re-emits electrons. Additional authors on this paper include Wouter Vlemmings, Chalmers University of Technology, Onsala, Sweden; Patrick Huggins, New York University, New York; Lars-Ake Nyman, Joint ALMA Observatory, Santiago de Chile; and Yiannis Gonidakis, CSIRO, Australia Telescope National Facility. ALMA, an international astronomy facility, is a partnership of Europe, North America and East Asia in cooperation with the Republic of Chile. ALMA construction and operations are led on behalf of Europe by ESO, on behalf of North America by the National Radio Astronomy Observatory (NRAO), and on behalf of East Asia by the National Astronomical Observatory of Japan (NAOJ). The Joint ALMA Observatory (JAO) provides the unified leadership and management of the construction, commissioning and operation of ALMA. The National Radio Astronomy Observatory is a facility of the National Science Foundation, operated under cooperative agreement by Associated Universities, Inc. 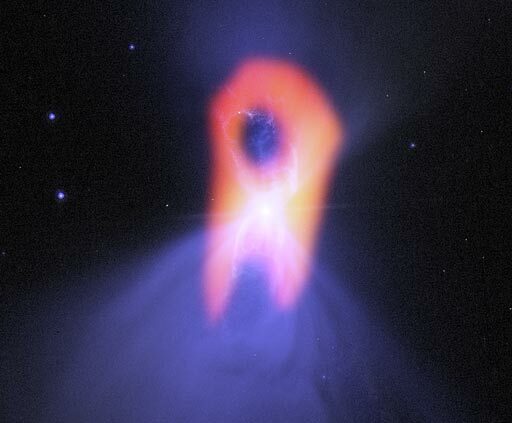 The Boomerang Nebula reveals its true shape with ALMA. The background blue structure, as seen in visible light (HST), shows a classic double-lobe shape with a very narrow central region. ALMA's ability to see the cold molecular gas reveals the nebula's more elongated shape, in red. For decades astronomers have dreamed of seeing a black hole. That dream may soon become a reality. 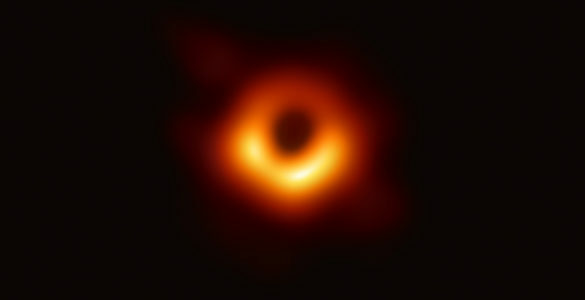 Using the EHT, with ALMA as its most sensitive component, astronomers have captured the first direct visual evidence of a black hole: an image of the supermassive black hole at the center of Messier 87 (M87), a giant elliptical galaxy 55 million light-years from Earth. Using ALMA, astronomers have observed the formation and mutually entwined motions of a massive binary star system. ALMA discovered ordinary table salt in a not-so-ordinary location: 1,500 light-years from Earth in the disk surrounding a massive young star. 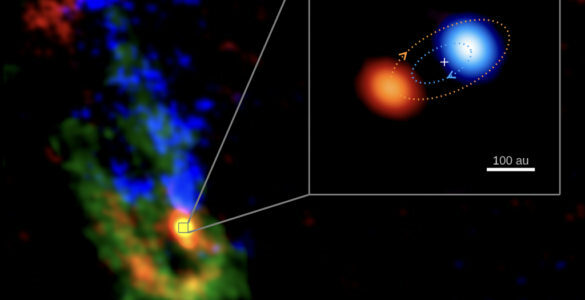 Band 10, ALMA’s highest frequency vision, has given scientists a new view of jets of warm water vapor streaming away from a newly forming star and uncovered an astonishing assortment of molecules. 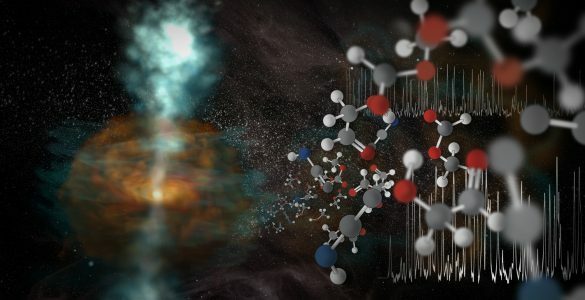 Astronomers have made the first definitive detection of a radioactive molecule in interstellar space: a form, or isotopologue of aluminum monofluoride. 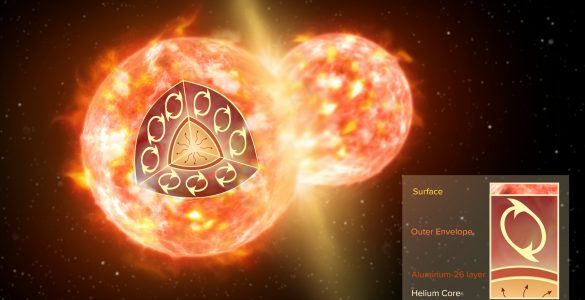 The new data reveal that this radioactive isotopologue was created by the collision of two stars, a tremendously rare cosmic event that was witnessed on Earth as a “new star,” or nova, in the year 1670. Harnessing the exquisite sensitivity of the GBT, astronomers have given one of Einstein’s predictions on gravity its most stringent test yet. 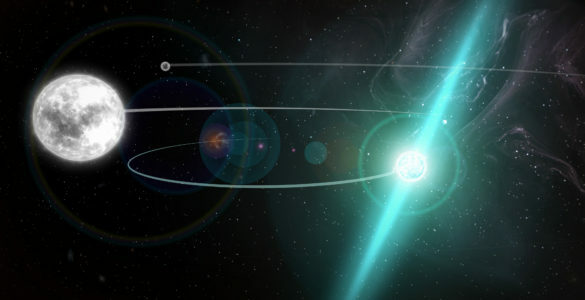 By precisely tracking the meanderings of three stars in a single system – two white dwarf stars and one ultra-dense neutron star – the researchers determined that even the most massive of objects “fall” in the same manner as their less-dense counterparts.